Who is it for? 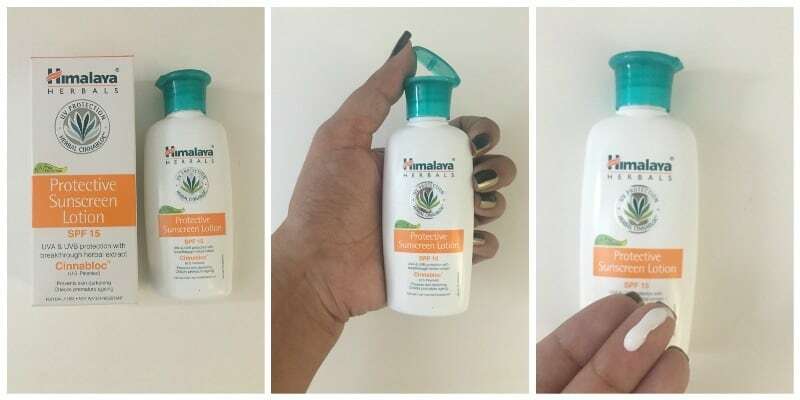 Himalaya Herbals Protective Sunscreen Lotion is for those looking for a daily sunscreen lotion, which also moisturizes the skin, and is ideal to be used indoors. Apply liberally on exposed skin like face, neck, and arms before going outdoors during the day. Avoid the area around eyes. No, but it does caution to avoid application around eyes and that it should not be used on children below 6 months of age. This moisturizer comes in a white plastic body with a green flip to open cap. The packing resembles the other products from the same brand. The 50ml bottle is quite compact and is ideal for traveling. The moisturizer is actually very light but one needs to massage it onto the skin else it will not get absorbed instantly. It isn’t too thick like a cream and has a consistency of a moisturizer. One needs to massage it into the skin; else it will leave a white cast on the skin like some of the other sunscreens also do. What I liked was that it did not leave behind any greasiness or stickiness. The skin felt smoother for a while but later I could feel the skin sweating as if I was wearing something on it, and I felt the urge to just wash the lotion off. I would prefer using it on my body and not my face as I have a combination skin which is acne prone, and when I applied it on my face I did not feel as comfortable as I would because I prefer a gel based or matte cream on my face. Though it hydrates the skin, it is not the best sunscreen in the market. I would prefer a sunscreen with higher SPF to protect my skin when I step out in the sun. This one is good for indoors as one must apply sunscreen even while staying indoors. I did not like that it has loads of parabens. Ideal to be used indoors. Has to be massaged into the skin so not an easy application as such. Not ideal to be put on the face if the skin is oily/ combination/ acne prone. Can feel heavy on the skin after a while, causing sweatiness. Not really, as I have used better sunscreens than this one. Jovees Sunscreen: Sandalwood SPF 30 – Best Sunscreen for Men in India ? Thank u 👍🏼 This did disappoint me as well! Not all Himalaya products are not worthy… This one does not have enough SPF plus leaves white cast… I better skip it.